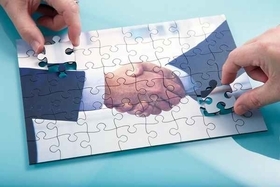 The boards of Jefferson Health and Einstein Healthcare Network have signed off on their proposed combination in a definitive agreement to merge, the Philadelphia-based not-for-profit providers announced Friday. Their union builds off an academic affiliation spanning two decades to create an 18-hospital system with about $5.9 billion in revenue. Their footprint would include more than 50 outpatient and urgent-care centers, leading rehabilitation and post-acute facilities, nearly 39,000 employees, and more than 2,000 residents and fellows, the most in the Philadelphia region. The definitive agreement, which was signed about six months after the letter of intent, now awaits the blessing of state and federal regulators. "Philadelphia has some of the largest health inequities and is home to six academic medical centers, so something needs to change," said Dr. Stephen Klasko, president of Thomas Jefferson University and CEO of Jefferson Health. "Two of the most creative organization taking care of the underserved decided to get together for the right reasons." Academic medical centers typically have higher cost structures related to their research arms and specialized tertiary and quaternary care. This can drive mergers and acquisitions that carry the expectation of scale yielding savings. Executives maintain that this partnership will enable them to care for more people closer to home rather than in higher-cost settings like hospitals. "We are like-minded institutions from a culture and mission standpoint, which made it easy for us to get to this point," said Barry Freedman, president and CEO of Einstein. Jefferson had an operating income of $11.96 million on revenue of $4.73 billion in 2017, down from $49.69 operating income on $3.96 billion of revenue the year prior. While admissions increased nearly 20%, salaries, wages and benefits jumped nearly 20% and supply costs increased about 19%. Einstein reported an operating loss of $23.09 million on revenue of $1.22 billion, down from $9.12 million of operating income on $1.19 billion in revenue in 2016. Expenses related to salaries and benefits increased more than 6% while external physician and clinician and professional service fees jumped nearly 10%. Non-operating costs related to pension benefits also dragged Einstein's balance sheet. Revenue from the Medicare and Medicaid programs accounted for about 70% of its net patient revenue. Consultants told Jefferson and Einstein that a merger of this size should produce anywhere from 2% to 5% in cost savings. While healthcare executives argue that the savings mergers produce will dwarf the cost of integration, economists warn that potential synergies do not offset higher cost structures. The systems plan to bundle purchasing to create more cost-effective contracts, coordinate care at their transplant and rehabilitation centers, and grow their telehealth network, among other initiatives. "We think we will be attractive to payers because we care for a large Medicare and Medicaid population," Klasko said. "We take care of their needs in the least expensive ways." Combining academic functions is also a driving force behind the merger, executives said. The next generation of physicians will need to bring more compassion to care delivery rather than just memorize data and medical literature, Klasko said. "They need to be self-aware, empathetic and culturally competent. That's a differentiating factor to choose us," he said. If the deal goes through, Einstein will add an equal number of members to the expanded Thomas Jefferson University board. Freedman will remain president and CEO while adding the role of executive vice president at Jefferson Health. Klasko, who last month was named part of Modern Healthcare's disrupters within the 100 Most Influential People in Healthcare 2018, will remain the CEO of Jefferson Health with Dr. Bruce Meyer as president of the clinical enterprise. Jefferson has grown from a three-hospital academic medical center to a 14-hospital system as the Pennsylvania market continues to consolidate. Jefferson has been incrementally growing its network over the past several years through partnerships with Abington in the Pennsylvania suburbs, Aria Health in the Philadelphia region, Magee Rehabilitation also in Philadelphia, Kennedy in New Jersey and Philadelphia University.